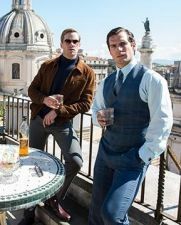 20th Century Flicks, BristolTHE MAN FROM U.N.C.L.E. Henry Cavill. Alicia Vikander. Hugh Grant. Jared Harris. Armie Hammer. Elizabeth Debicki. Luca Calvani. 1960s. Thriller. Action/Adventure. Nuclear. 1960s. Nuclear. Action/Adventure. Thriller.